Hertha Berlin's Ivorian forward Salomon Kalou compared racism to terrorism as he explained why his Bundesliga side "took the knee" on Saturday. Before the game against Schalke, Hertha staff copied the protests started by NFL quarterback Colin Kaepernick against treatment of black Americans. "It's like terrorism - either you're against it or for it," said Kalou, 32. "If you don't do anything against it, don't criticise people who do, or have any type of judgement towards them." Former Chelsea player Kalou denied Hertha's protest, which the German club said stood for "tolerance and responsibility", was a publicity stunt. "That's not right," replied the Ivory Coast international, who has also played for Feyenoord and Lille. "Racism is a bad thing and terrorism is a bad thing - you [either] do something about it or you don't say anything about people who do something about it. "We stand against any form of racism and it was our way of showing - as a team, as Hertha Berlin and as the city of Berlin - that we are going to fight against this sort of behaviour." 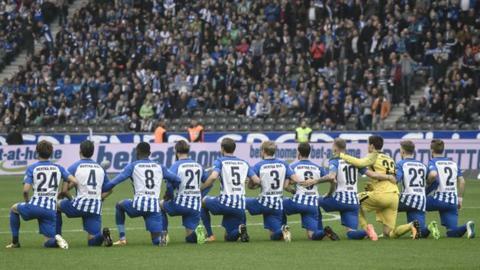 On Saturday, a tweet posted on the official Hertha Berlin account said the Bundesliga club stands for "a tolerant Berlin and an open-minded world, now and forevermore", before adding the hashtag #takeaknee. The club lost Saturday's home match with Schalke 2-0 and sit 13th in the Bundesliga. Kaepernick started his protest last year when the then San Francisco 49ers player sat down as the American national anthem was played during a pre-season American football game in 2016. He explained his gesture, which later morphed into "taking the knee" after he decided to kneel following a conversation with a US military veteran, was meant to highlight racial injustice and police brutality against African Americans. US President Donald Trump has heavily criticised the American protests, saying NFL players who refused to stand during the national anthem should be fired. Kalou, meanwhile, believes the symbolism of the protest shows "how the world should be". The only black player in Hertha's starting line-up against Schalke also rejected suggestions the protest was prompted by any racist insult directed his way. "I don't think something has to be happening for us to fight against this kind of behaviour," said Kalou, who joined Hertha in 2014. "We live in 2017 and I think the world is better together - and we show this on the pitch. "In our team, we have different kinds of people - I'm from Africa, Genki [Haraguchi] is from Japan and we have European players as well - so we show the real figure of how the world should be. "It's a beautiful image to show and I'm glad we did it."